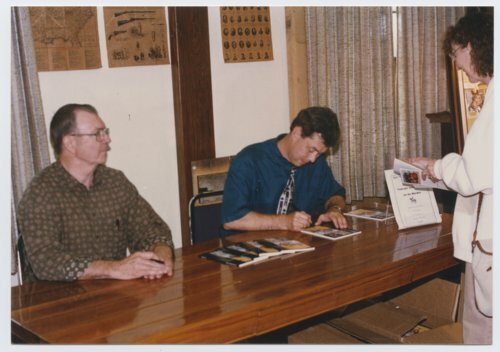 Here are four photographs showing Leo Oliva, author, (on the left) and Jerry Thomas, artist, (on the right) at book signing in Fort Scott, Kansas. Leo Oliva was the author of "Fort Scott, Courage and Conflict on the Border" and Jerry Thomas painted the artwork for the book's cover. The book was published by the Kansas State Historical Society in cooperation with the Kansas Forts Network.